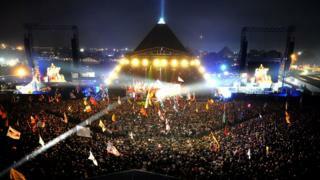 Glastonbury: Who could replace Foo Fighters? This article was published before Florence + The Machine were confirmed as replacement headliners for Foo Fighters. Image caption Who can fill the Dave Grohl hole? The phones will be red hot at Worthy Farm as Glastonbury organisers try to book a last-minute replacement for Foo Fighters. The US rock band had to pull out of their headline slot after Dave Grohl fractured his leg in a stage fall. But who is likely to step in for the Foo Fighters on 26 June? Already on the bill, and basking in the afterglow of their third number one album, Florence and the Machine are the most likely choice. Proven festival headliners with a set of earthy, mystical songs they fit neatly with the Glastonbury ethos. Hits like Kiss With A Fist and Shake It Up will sound perfect as the sun sets in Somerset, and their promotion up the bill would help settle a gender imbalance. But singer Florence Welch should be wary of the curse of the Pyramid Stage - she broke her foot while playing Coachella in April. Never bad at Glastonbury, the Britpop survivors played the gig of their lifetime at the 2009 festival. The set was so emotional, Damon Albarn even broke into tears after To The End. A brilliant new album, The Magic Whip, would stop a 2015 set being a repeat performance with songs like Ong Ong and Lonesome Street going down particularly well at the Isle of Wight Festival last weekend. Albarn also has form in helping Glastonbury out of a crisis - he brought his animated hip-hop collective Gorillaz to the main stage when U2 dropped out in 2010. Although it was a poorly received set. A natural substitute for the hard-rocking riffage of the Foo Fighters, AC/DC were widely rumoured to be in the frame for Glastonbury earlier this year. But the band poured cold water on the story, with frontman Brian Johnson describing the festival as "wellies and corporate". But after hearing Metallica had played in 2014, their attitude softened. "If they ask… OK," said guitarist Angus Young. Detractors say the band has been writing the same exact song over and over for years - but it's a pretty good song, and Glastonbury would be a perfect place to air Highway to Hell and Back in Black. Luckily, they're between dates on their European tour on 26 June. Emily Eavis probably has Chris Martin on speed dial. The band are a reliable Glastonbury stalwart, with anthems aplenty. Glastonbury also gave the band a considerable leg up in 2002, when they were booked to lead the Pyramid Stage while still relatively untested. Nevertheless, they were the talk of the festival afterwards, thanks to a particularly heartfelt rendition of The Scientist. A headline slot would give fans a rare chance to hear last year's well-received Ghost Stories album live - the group only played two UK dates on their brief world tour. But they might want to hold fire until next year. Chris Martin has hinted the band's seventh studio album could be their swansong. Assuming Dave Grohl, the nicest man in rock, doesn't want to leave Glastonbury in the lurch, he could put in a call to his good friends Queens of the Stone Age. Josh Homme's band played a blistering headline set on Glastonbury's Other Stage in 2013, drawing a sizeable crowd despite being scheduled against Beyonce. They're currently in the recording studio, but have scheduled to play Rock in Rio this September, which means they could be battle ready. A popular suggestion on social media, Swift is certainly riding a wave this year, thanks to the unassailable pop of her new album 1989. Handily, she's in the UK next week and has Friday night off before playing the BST festival in Hyde Park the following day. But it's been a long time since Glastonbury booked such an unashamedly commercial act as its headliner - and while the crowd would undoubtedly lap up Shake It Off and Blank Space, they might find the country elements of her set unpalatable. Maybe she could win the crowd over with a headbanging cover the Foo Fighters' Best of You? Every year, a rumour sweeps around Glastonbury that Daft Punk are "definitely" playing a secret set over the weekend. Why should this year be any different? He's been listed as a potential headliner for years, and at one point looked set to sign up for 2015. For whatever reason, negotiations fell apart but a last-minute booking would suit the star's hit-and-run philosophy. If the Minneapolis musician did pop, it would undoubtedly go down as one of Glastonbury's legendary performances. He's at the top of his game, thanks to his muscular, perfectly-drilled new band 3rd Eye Girl - and, as he's fond of telling audiences: "I got so many hits we don't have time to play 'em all." But even just the staples of his set - Raspberry Beret, Purple Rain, Let's Go Crazy, Kiss, Little Red Corvette - would be the envy of any headliner. The Chain, Don't Stop, Tusk, Black Magic Woman - Fleetwood Mac have no shortage of hits to supply to the Pyramid Stage. But, it seems, they're not that keen on travelling down to Somerset. Their Isle Of Wight set last weekend was billed as a "worldwide festival exclusive", and organiser John Giddings claimed Glastonbury bosses were green with envy. "Michael Eavis said, 'How did you get Fleetwood Mac?' I said, 'I paid them!'" he told Music Week. If the band were to capitulate, though, they'd have to cancel or postpone a show at London's O2 Arena, which is booked for the same night. Muse last headlined Glastonbury in 2010, welcoming The Edge on stage in the year that U2 were forced to pull out. Their star has waned in the intervening years (with the critics, at least) but they are still a thrilling, compelling live act. On their new album, Drones, they've ditched the frilly faux-operatics of their more recent work in favour of proto-metal riffs and Matt Bellamy's soaring vocals. The opportunity to hear Knights of Cydonia charging over the fields of Worthy Farm again is not one to be be missed - but there's one small problem. They're already headlining the Bravalla Festival in Sweden that night. At the time of writing, no-one from Glastonbury has denied this tweet.